The IBM Ultrium External Tape Drive is one building block of a family of scalable, flexible tape solutions. By leveraging advanced Linear Tape- Open (LTO) technology, the IBM Tape Drive is suited for handling the backup, save/restore, and archival data storage needs of a wide range of small systems. The IBM Ultrium External Tape Drive has a capacity of up to 200 GB with compression (2:1). As your needs grow, you can build on this storage investment by moving to the IBM Tape Autoloader (2:1 compressed data capacity of up to 1.4 TB). As your storage requirements continue to grow, you can choose the IBM Ultrium Scalable Tape Library (2:1 compressed data capacity of up to 14.4 TB) or the IBM UltraScalable Tape Library (2:1 compressed data capacity of up to 496.2 TB). The tape media is interchangeable among all four devices.With its higher capacity and performance, the IBM Ultrium External Tape Drive is an excellent alternative to DLT, 1/4-inch, 4 mm, or 8 mm tape drives. It has a sustained data transfer rate of up to 30 MB/sec (compressed 2:1). Single Drive without autoloader - The IBM 3580 H11 features Ultra/Wide SCSI HVD interfaces, attaching to IBM RS/6000, IBM RS/6000 SP, IBM AS/400, and IBM Netfinity systems, and non-IBM servers, workstations, and personal computers. Single Drive without autoloader - The IBM 3580 H13 features Ultra/Wide SCSI HVD interfaces, attaching to IBM RS/6000, IBM RS/6000 SP, IBM AS/400, and IBM Netfinity systems, and non-IBM servers, workstations, and personal computers. Single Drive with autoloader & 7 cartridge slots - The IBM 3581 H17 features Ultra/Wide SCSI HVD interfaces, attaching to IBM RS/6000, IBM RS/6000 SP, IBM AS/400, and IBM Netfinity systems, and non-IBM servers, workstations, and personal computers. Single Drive with autoloader & 7 cartridge slots - The IBM 3581 H13 features Ultra/Wide SCSI HVD interfaces, attaching to IBM RS/6000, IBM RS/6000 SP, IBM AS/400, and IBM Netfinity systems, and non-IBM servers, workstations, and personal computers. Single Drive without autoloader - The IBM 3580 L11 features Ultra2/Wide SCSI LVD, attaching to IBM RS/6000, IBM RS/6000 SP, IBM AS/400, and IBM Netfinity systems, and non-IBM servers, workstations, and personal computers. The Ultrium Tape Drive 3580 Model L23 is an external stand-alone or rack-mountable unit and is the entry point for the family of IBM Ultrium tape products. The Ultrium Tape Drive 3580 model L23 is designed to provide an excellent migration path from digital linear tape (DLT or SDLT), 1/4-inch, 4mm, or 8mm tape drives. 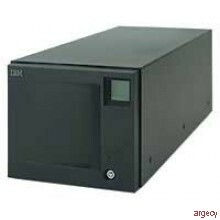 The 3580 IBM System Storage TS2350 Tape Drive Express Model S53 (machine type 3580), external stand-alone or rack mountable unit, is designed to offer high capacity and performance for the midrange systems environment. The TS2350 incorporates the Linear Tape-Open (LTO) IBM System Storage Ultrium 5 Full-High Tape Drive, which is designed to provide maximum tape drive throughput native data rate performance of up to 140 MB/sec compared to the IBM TS2240 LTO full-high Tape Drive (Ultrium 4) at up to 120 MB/sec native data transfer rate. In addition, with the use of the IBM LTO Ultrium 5 1.5 TB Data Cartridge, the IBM TS2350 Ultrium 5 Tape Drive provides nearly double the tape cartridge capacity with up to 1.5 TB native physical capacity (3.0 TB with 2:1 compression) compared to previous Ultrium 4 800 GB (1.6 TB with 2:1 compression) Tape Cartridges. IBM Ultrium 5 Tape Drives can read and write LTO Ultrium 4 data cartridges, and can read LTO Ultrium 3 data cartridges. The Ultrium 5 Tape Drive is encryption-capable and designed to support application managed encryption. IBM TotalStorage Ultrium Tape 2U Autoloader 3581 Models L28 and F28 offer high capacity, performance, and technology designed for the midrange open systems environment. These models incorporate a single Linear Tape-Open (LTO) IBM TotalStorage Ultrium 2 Tape Drive, which more than doubles tape drive performance over the previous generation LTO Ultrium 1 Tape Drives (Ultrium 1), up to 35 MB/sec native data transfer rate (70 MB/sec with 2:1 compression). In addition, with the use of the new IBM TotalStorage LTO Ultrium 200 GB Data Cartridge, the Ultrium 2 Tape Drive has the capability of writing twice as much data, up to 200 GB native capacity (400 GB with 2:1 compression). IBM Ultrium 2 Tape Drives can read and write original LTO Ultrium Data Cartridges at original Ultrium 1 capacities and with an improved performance of up to 20 MB/sec native data transfer rate (40 MB/sec with 2:1 compression). The Model L28 comes with a LVD Ultra160 SCSI attachment, while the Model F28 comes with a Native Switched Fabric Fibre Channel attachment, for connection to a wide spectrum of open systems servers. The IBM 3581 Tape Autoloader Model F38 has 8 cartridge slots, a 400 GB native data capacity, 800 GB data capacity with compression, 1 Ultrium 3 tape drive, Native Switched Fabric 2Gbps Fibre channel attachment, and language support. Maximum data transfer rates are 80 MB/Sec Native and up to 160MB/Sec if 2:1 compression is achieved. The Model F38 has a Fibre Channel interface. The 3581 Tape Autoloader can be attached to the IBM eServer i5 and iSeries, IBM eServer p5 and pSeries, IBM eServer xSeries, AS/400, RS/6000, RS/6000 SP systems, Netfinity, and non-IBM servers, workstations, and personal computers that support those interface specifications. Single Drive without autoloader & 7 cartridge slots - The IBM 3581 L13 features Ultra2/Wide SCSI LVD, attaching to IBM RS/6000, IBM RS/6000 SP, IBM AS/400, and IBM Netfinity systems, and non-IBM servers, workstations, and personal computers. Single Drive with autoloader & 7 cartridge slots - The IBM 3581 L17 features Ultra2/Wide SCSI LVD, attaching to IBM RS/6000, IBM RS/6000 SP, IBM AS/400, and IBM Netfinity systems, and non-IBM servers, workstations, and personal computers. The IBM TotalStorage UltraScalable Tape Library 3584 now supports the IBM TotalStorage Ultrium 2 Tape Drive. It more than doubles tape drive performance over the first generation LTO Ultrium Tape Drive and is designed to support up to 35MB/sec native data transfer rates (70MB/sec with 2:1 compression). In addition, with the use of the new IBM TotalStorage LTO Ultrium 200GB Data Cartridge, the IBM TotalStorage Ultrium 2 Tape Drive doubles the tape cartridge capacity up to 200GB native capacity (400GB with 2:1 compression). IBM TotalStorage Ultrium 2 Tape Drives can read and write original LTO Ultrium data cartridges at first generation Ultrium 1 capacities with improved performance. The Ultrium 2 tape drives and cartridges can be resident in the same 3584 Library frame with first generation original Ultrium tape drives and cartridges. The UltraScalable Tape Library is designed with a variety of advanced features. The multi-path architecture is designed to simultaneously attach heterogeneous servers and applications to LTO logical library partitions, including mixed Ultrium drives and media. Remote management capabilities using a Web browser provides library control and configuration. Simple Network Management Protocol (SNMP) functionality is also included. LTO I/O expansion capability is available with a 20-cartridge option which can be added to the standard 10 cartridge feature. Hot swap drives and redundant power offer enhanced availability. New control path failover for AIX and 110 volt power options are also available.